St Michael and All Angels Blackheath Park is the parish church of the Cator Estate, named after John Cator who in 1783 bought the estate of Wricklemarsh House, built in 1724. Cator had little use for the house and demolished it in 1787. It stood roughly where Blackheath Park and Pond Road intersect. A church was then considered essential for any new development. The Cator estate lay partly in the parishes of Lee and Charlton and partly in the Liberty of Kidbrooke. The last had no church and those of the other two were at some distance. The solution was a proprietary chapel, paid for by a benefactor. In 1828 J B Cator gave £4000 and a plot of land and the chapel was completed in February 1830 to the design of George Smith (1783-1869). Smith used Gothic Revival for the new chapel, by 1830 the most widely used style for churches. The spire is the most prominent feature and, like the rest of the church, is unlike anything a mediaeval mason would have produced. Exaggeratedly tall and thin, the detail is quite unhistorical. It is at the east end, probably as an eye-catcher to make the central cross-roads more impressive. Rather awkwardly, porches were added to both main doorways and a vestry of 1878-79 north of the tower. It is a basic utilitarian structure, but the plans are by Richard Norman Shaw (1831-1912), designer of the original New Scotland Yard. Baptisms, marriages and burials were not allowed in a proprietary chapel, so the minister then earned his living from rents for pews and donations. 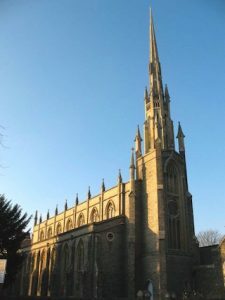 A separate parish was approved in 1874 and the chapel was then re-dedicated to St Michael and All Angels, having formerly been called either Trinity or St Peter’s Chapel.